A year-long extension program supported by South West Catchments Council has helped 12 livestock entities implement changes to increase pasture production, improve fodder conservation and make cost-effective supplementary feed purchases. The Grazing Matcher Program, facilitated by agricultural advisors Jeisane Accioly-McIllree, Dan Parnell and Martin Staines, helped producers fine-tune or implement a basic form of rotational grazing using plant cues. 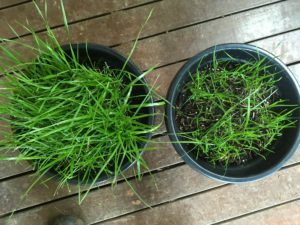 Grazing ryegrass at the 2-3 leaf stage and moving stock when pasture has been grazed to 4-6 cm are two cues that helped producers grow more pasture with more capacity to recover quickly. Retaining 4-6 cm of pasture residual post-grazing was the most significant change implemented by Upper Capel producer Paul Fry. Grazing residual pot-demonstration. Pots were cut at different heights, 5 cm (left) and 2 cm (right), in late April and late May. Image taken in early June. The program also helped producers understand the cost of fodder production, how to avoid wasting fodder and how fodder quality can be improved. Several producers improved their fodder quality by fine-tuning when the pasture is cut and how quickly it is dried and baled, and adopted feed testing to monitor the quality of fodder either produced or purchased. Ken MacLeay, who runs a beef stud in Vasse, said the program renewed his enthusiasm for silage. Participants who analysed fodder produced in 2018 reported significant improvements in protein and energy content compared to 2017. For example, Ken’s 2018 silage had higher metabolisable energy (10.6 compared to 9.5 MJ/kg DM in 2017) and higher crude protein (16.7% compared to 9.1%). Another key learning from the program was understanding the amount and balance of energy and protein required by different stock classes to either maintain or build condition. This can be particularly important to maintain or increase pregnancy rates. Richard Walker from Wilga said that the program helped him refine his feed input during the worst season he’d ever experienced. David and Linda Brumby from Ferguson Valley also saw real benefits by getting a better feed balance. Jeisane Accioly (left) demonstrating how to condition-score cattle. Matt Camarri, who farms in Cundinup and Busselton and has rotated cattle through paddocks for 20 years suggested that rotational grazing can also improve pregnancy rates. 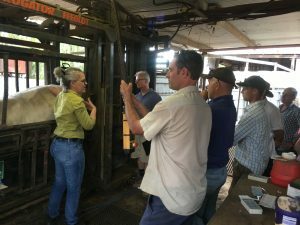 The complexity of implementing changes recommended by advisors was helped by providing time for field walks and networking between producers, who met eight times over 12 months at participating properties and also visited two “case study” farms. This network was particularly valuable to those without extensive networks, such as Linda and David Brumby who manage 80 hectares in the Ferguson Valley. The 2018 program was supported by South West Catchments Council Regional Landcare Facilitator with funding from the Australian Government’s National Landcare Program, Meat and Livestock Australia’s Profitable Grazing Systems Initiative, Western Beef Association Inc., and producer contributions. Places are available for the next Grazing Matcher Program, due to start in March 2019, and is limited to eight businesses at a cost of $600 for up to two participants per business.